A year ago, I embarked on an ambitious reading project – read 100 books in honor of the centennial year of the Rochester Public Library – 1 book from each year the library has been in existence. It was an adventurous year of reading, from early serial fiction (The Adventures of Kathlyn) to poignant stories of the human spirit (All Quiet on the Western Front, My Antonia, Speak, Night) to pure fluff and fun (Peyton Place, Harry Potter). Today, I file my final entry in the project and close the door on 2011, the Year of Reading the Past. 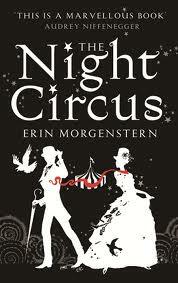 The Night Circus by Erin Morgenstern – Le Cirque des Reves appears suddenly, without warning, and with little fanfare. Its black and white tents seem to unfold from the ground, filled with unimaginable, wondrous magic controlled by two powerful magicians, Celia and Marco, who find much more than they bargained for in this lyrical book. Destined to compete with one another in a game arranged by their mentors, Celia and Marco find themselves falling in love, when everything they know works against them. The power surge they each experience when they are near to one another or when they touch disconcerts and frightens not only them but the people around them. Can they allow their stories, begun without their knowledge, to play out under the circus tents, or will their love end it all? There are really few words that can adequately describe this book. It is one of the rare stories that hasn’t been told before, at least not in the lilting, enchanting words of author Morgenstern. Part fantasy, part love story, part magical reality, The Night Circus is hands down one of the best of 2011. Jean, glad you enjoyed the journey. I wasn’t at all sure I was going to make it! I agree Patty, I loved The Night Circus. It was my favorite for 2011. What a great finale to 100 books. 100 years. Thank you for this project, I enjoyed following your progress. Once you got to the 1950’s it was fun to see how many of the titles I had read.